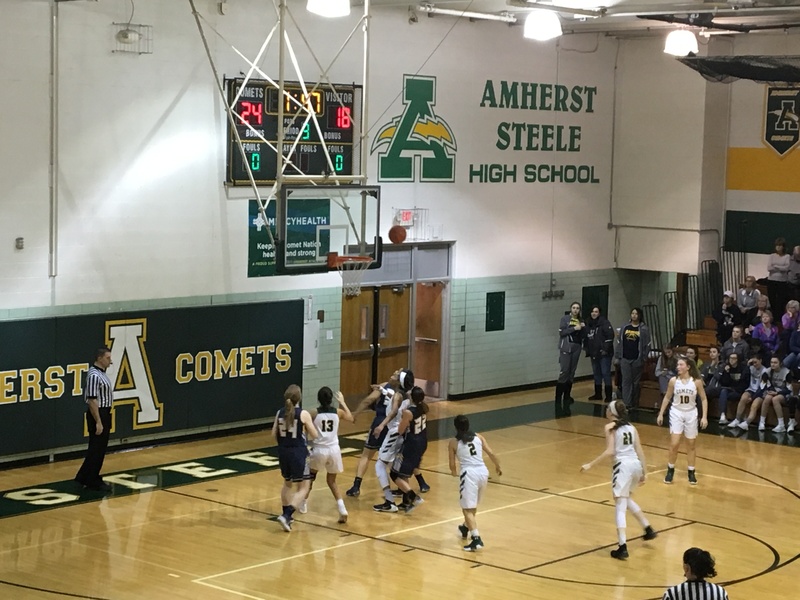 AMHERST, OHIO– Coming into Saturday afternoon’s game against the Amherst Comets, free throws had been a sort of Achilles’ heel for the North Ridgeville girls basketball team. But down the stretch, going 8-for-8 from the charity stripe in the final minutes is exactly what earned the Rangers a 51-49 win over their Southwestern Conference rivals. At the end of the third quarter, the Comets held a 32-28 lead. In the opening minutes of the fourth, Amherst would extend that lead to eight points thanks to two quick baskets from Katie Iliff before North Ridgeville’s Izzy Geraci and Lauren Milner went to work on the offensive end. A Geraci layup followed by a Milner 3-pointer cut the Comets’ lead to four points. A 3-pointer from Leia Smith a few possessions later followed by a steal on the other end led to a Geraci fast break lay-up to pull the Rangers to within one. Continuing to attack the rim was the biggest message Esser had for her team in the fourth quarter as they mounted their comeback. “We knew we could get to the rim, but it was just a matter of being aggressive and attacking and just making solid decisions on the defensive end,” Esser said. With three minutes remaining in the game, Ridgeville buckled down on the defensive end and found Milner from beyond the arc again to put the Rangers up, 41-39. It was the first time North Ridgeville led in the second half. A minute later, Geraci split the Comet defense with a hard drive to give the Rangers a four-point lead that Amherst would counter on the next possession with an and-one layup from Amaya Staton. A steal and a layup from Amherst’s Faith Lewis the following possession gave the Comets a one-point lead with 1:09 remaining. The next North Ridgeville possession, Geraci drew a foul and sunk both free throws to put the Rangers ahead for good. The Comets were forced to foul both Geraci and Milner in the waning seconds. and the pair each sunk four free throws to help seal the win. After scoring just two points in the first half, Milner ended up with 10 in the fourth quarter alone, proving to be an offensive difference maker down the stretch. Geraci ended the afternoon with a game-high 25 points. In the first quarter, she singlehandedly stopped the bleeding for North Ridgeville after the Comets got off to a quick 12-3 lead behind eight points from Iliff and four from Staton. To close out the quarter however, it was the Geraci show. Her hard drives to the rim led to the Rangers taking a 15-12 lead in the beginning of the second quarter as she went on a 12-0 run by herself. Geraci also said that all afternoon she felt like the Comets were giving her her right hand on her drives, and she was more than happy to take advantage of that. Also doing damage for the Rangers was Smith, who scored 13 points, seven of which came in the third quarter. For Amherst, Iliff had 23 points while Staton had nine and Lewis added five.